Visiting the medieval town of Antequera is an opportunity to see sites that go as far back as the Bronze Age with burial mounds, Roman baths, and a well preserved old quarter filled with churches and buildings of the Renaissance and Baroque period. The surrounding valley is one of the most fertile in Andalucia and a big producer of olive oil. Hence there are olive trees everywhere, and in the summer the fields turn bright yellow with sunflowers. As you approach the town, the first thing that strikes you are the church spires and the towers of the Moorish fortress which stands silhouetted against the sky. The fortress was built to defend the town against the Catholic Spanish troops from the north and for two hundred years the Medina Antaquira was repeatedly attacked by Christian kings until eventually in 1410 Ferdinand I of Aragon conquered the city. La Peria de los Enamorados is an enormous limestone crag which overlooks the town and is referred to as Lovers Leap. Legend has it, a young Christian from Antequera fell in love with a beautiful Moorish girl from Achidona and confronted by Moorish soldiers they were forced to either renounce their love or leap to their deaths. It was not until Granada, the last Moorish city, was captured in 1492 that Antequera was able to begin to recover from centuries of fighting. Mosques were torn down and replaced with new churches, the oldest being Iglesia San Francisco which was built around 1500AD. If you are looking for a hotel with a relaxed ambience the Parador Hotel Antequera is definitely an experience you will enjoy with its own seasonal swimming pool surrounded by lovely gardens. It is a modern hotel with its own restaurant that specialises in traditional local dishes. Antequera’s museum exhibits almost eighty percent of all the treasures in the province which makes it one of the cultural centres in Andalusia. During the 16th century a university was founded and became an important meeting place for Spanish Renaissance writers and scholars. A school of sculpture was also founded during that century and many of the artists were employed to build churches in Seville, Malaga and Cordoba. If you visit the Palacio del Marqueses de Villadarias you will see an impressive doorway built of red marble from the mountain El Torcal. The El Torcal Nature Park is one of many interesting places to explore outside of Antequera. Made up of fascinating abstract landscape and unusual formations there are also over 30 varieties of orchids growing in the park. Also on the outskirts are two Bronze Age burial mounds which date back to 3000BC. The largest is 25m in diameter and 4m high and probably served as a grave for the ruling families. The path leading into the centre of the stone structure was covered up with earth and makes up the hill you see today. When the grave was opened by a team of archaeologists in the 19th century they discovered several hundred skeletons. Other nearby places of interest include the spa and village of Carratraca, the lake district of El Chorro and the Fuente de Piedra Lagoon, known as the Pink Lagoon because it is a favourite watering hole for flamingos migrating to Africa in the winter. On the edge of town are the most famous caves in Europe. The Dolmen caves date back to 2500BC and were discovered by a local gardener in 1905. But I have to admit the Lobo Wolf Park would be top of my list as it is a rare opportunity to see wolves up close in this semi-natural habitat. 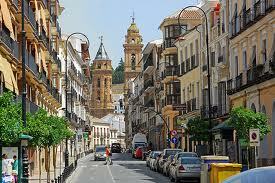 The nearest airport is Malaga and there are now shuttle buses to bring you to Antequera. However, with so much to see and do in the surrounding area you may want to think about hiring a car. Either way you will need more than a few days to be able to enjoy it all.